German automaker Volkswagen unveiled their single-seat electric vehicle named Nils at the Frankfurt Motor Show. The concept car touts an aluminum frame, top-hinged doors and exposed wheels on the outside and a zero-emissions engine on the inside. The car has a top speed of 80 m.p.h.! Just 10 feet in length, 4.5 feet wide and 3.9 feet tall. Driver in the middle, engine out back, wheels outboard and free-standing. 0 to 62 mph in less than 11 seconds. 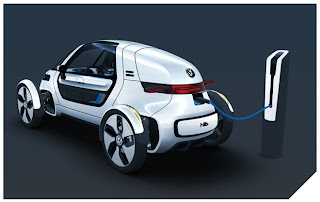 Lithium-ion battery with a capacity of 5.3 kWh; range up to 40 miles. Charging duration two hours.